Update: Tableau 10.4 is here! Download it now to try out the features outlined below. In this release, we’re getting the right data in front of the right people, across the enterprise. Data source certifications help organizations promote the best sources for teams to use. They work seamlessly with our expanded recommendations for data sources, which leverage machine learning to suggest optimal data sources for your specific analysis. You’ll feel confident exploring data whose quality and relevance is guaranteed. Get everyone speaking the same language. Discussions engage the experts around you in conversation threads that root your business decisions in the facts. You’ve got data, and you’ve got smart people. In Tableau 10.4, join the two with data source certifications. Your data experts can now approve data sources uploaded to Tableau Server and Tableau Online for broader use. You’ll trust your analysis, because it’s based on blessed, up-to-date data. IT will be happy, too, knowing that data prep and ETL investments are being used across your organization. On the Data Sources pane, select the “certified” icon to ensure the quality of data sources for others to use. Try this for sources that are frequently accessed, perfectly prepped, or are the go-to resources for analyses that elicit multiple sources of data to choose from. The magic doesn’t stop there. We’ve added recommendations for data sources to take advantage of the collective expertise of your organization. Eliminate unnecessary work by using data that’s already been prepared: Leverage machine learning-generated recommendations to find the data that’s right for your analysis. 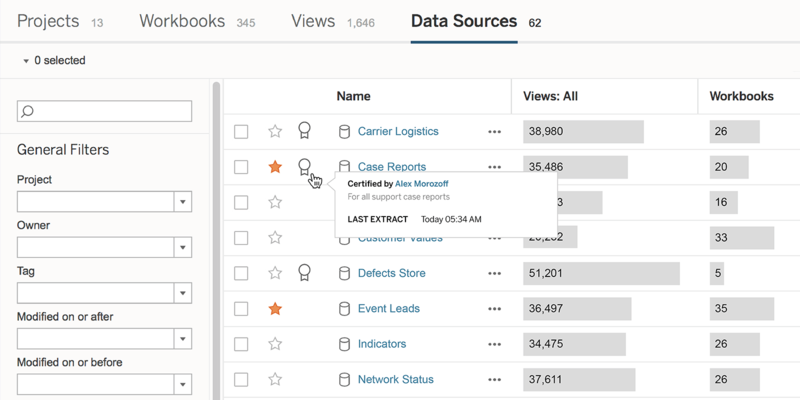 Select the Recommended Data Sources tab in Tableau Desktop to discover which data will help you best answer your questions. Try it out for a confidence boost when beginning a new analysis. Never worry about Tableau Desktop and Tableau Server compatibility again. 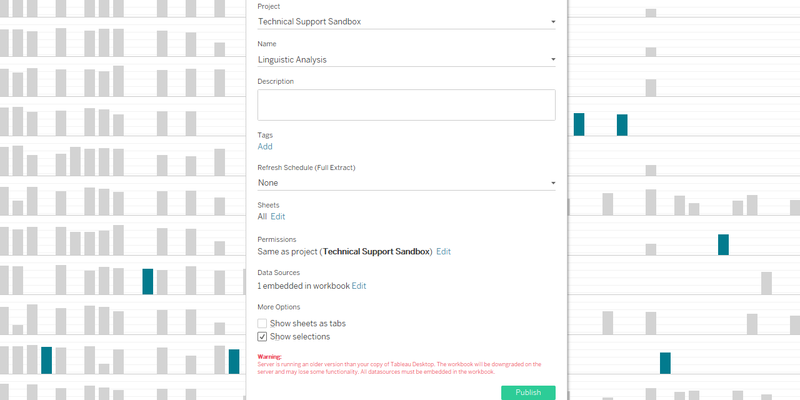 You can now downgrade and publish workbooks when connected to older instances of Tableau Server (10.2 or higher). Now your data and visualizations will be available on Tableau Server, even if it hasn’t been upgraded yet. 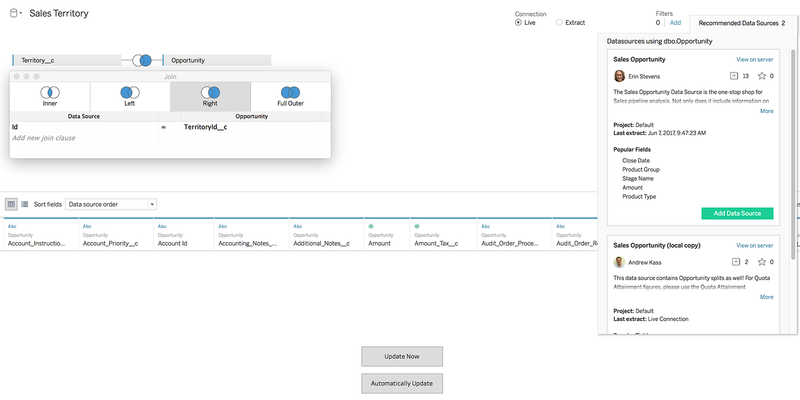 Tableau automatically compares your Tableau Desktop and Tableau Server versions to guarantee that published workbooks are accessible to the rest of your organization. You publish your vizzes to Tableau Server or Tableau Online for others to view, explore, and iterate on. It’s time to take it a step further. 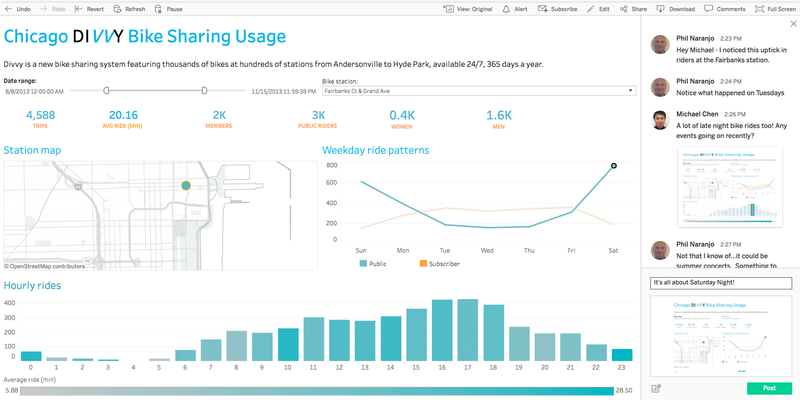 With discussions, Tableau brings a new level of engagement with your data: Interact, share, discuss, and make collaborative, data-informed decisions directly in your viz. But true collaboration is more than a conversation thread. Viz snapshots allow you to extend the analytical flow by storing filters, selections, and actions taken by other users. More than a static image, you can apply previous selections by clicking on a preview thumbnail to pick up where your fellow data explorers left off. It’s easier than ever to answer questions together, or to get the clarity you need for diving deeper into your analysis. Click the Comments button in any workbook toolbar to access both these features. Viz snapshots are added directly in your comments, so you can bring the richness of Tableau to your data conversations. 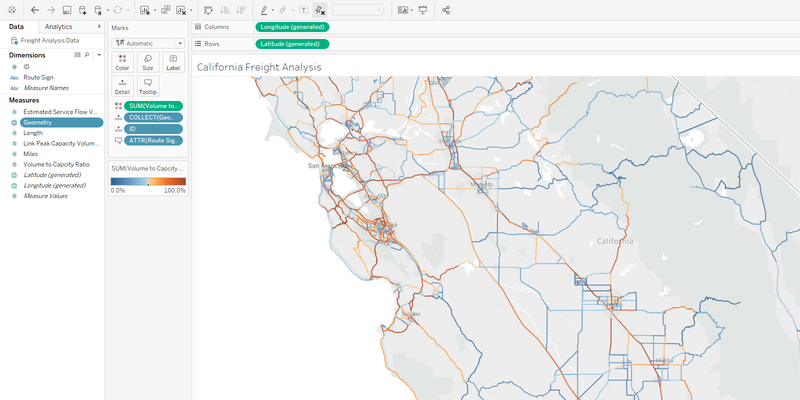 We’re taking mapping beyond polygon and point shapefiles: Tableau 10.4 supports linear geometries. Take advantage of your shapefiles to visualize powerful custom networks, from hiking trails to pipelines. We believe in a world where you can visualize all your spatial file data. 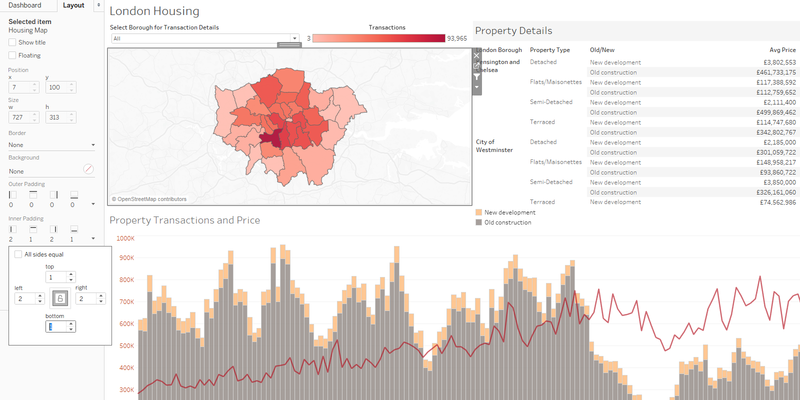 Connect to linear geometry files in Tableau to instantly see and understand your spatial data. Try it for visualizing roads, trails, pipelines, and more. For the data designers among us, Tableau 10.4’s improved dashboard spacing will give you ultimate control of your viz. Configure borders, whitespace, and background color for any object on a dashboard. Open the Layout pane to customize dashboard spacing to your heart’s content. Try it for dashboards with more than two views. Visit the Coming Soon page to see all features planned for Tableau 10.4. We’ll update the site throughout the beta period with more info and deep dive videos. We are working hard to get Tableau 10.4 out the door, but first we need your input! We want your feedback as early as possible to catch any issues and ensure great new features. Check out our beta program to learn more and sign up. The features included in beta and in the final version of Tableau 10.4 may change over time as we get feedback from beta users. Every release we include features that the community asks for, and 10.4 is no exception. Visit the Ideas section of the community to see which ones have been incorporated based on your feedback. And be sure to continue adding ideas to inspire our development team. We couldn’t do it without you. One last thing… did you hear that Tableau Server on Linux is just around the corner? Sign up for the Linux beta, and we’ll let you know as soon as the penguin is ready to play. Not all functionality described above is available in the Beta program today. Some features will be added in the coming weeks. The beta program is available for existing Tableau customers. Customers with an active maintenance license can upgrade for free when Tableau 10.4 is released. With the introduction of backwards compatibility, what will be the baseline. 10.2?. I assume this will be the same for Desktop and Reader. Yes, we are looking to establish the workbook version compatibility baseline at or around version 10.2. There are a few other interactions here we're considering so it may change before release but that's our goal at this time! I am a consultant in the home health industry. Do you have data in that industry? will it also be possible to downgrade to a previous version without using the server? so just save it for the 10.2 reader for example? Downgrade and Publish is intended for Desktop to Server interactions only. We are, however, working on a feature that will allow for Desktop to downgrade workbooks locally, without using Server. Coming soon! Awesome, that would be really usefull.. I tried to connect to sql server with this Beta version, one Geometry data type column can't display on data source. So this is not working for sql server geometry data type column, right? Is it only work for flat file shape file? does TabMon require an update to support Tableau 10.4 beta? good stuff, when are we going to have the trasparent background of the chart to be able to see the backgrond of the dashboard?